I probably should have titled this Image Maps in 3D, but I'm demonstrating one particular example of frosted glass. Before I get into this example, I do want to explain image maps. All images are the same in 3D. They have different intensity values in different locations across the image. It's all about intensity. Once you understand this concept in any 3d software program, you can master materials. Essentially 3ds max reads black as being 0% and white being 100%. Everything grey is in between depending on how grey they are. This works for any slot in your material that allows a map to be read for it's value. By default they have numerical values, but that will apply to the entire material. If there is a pattern that you want the values to follow...well that's when you use an image map. If this image were plugged into the opacity slot, then it would be an opacity map. All of the black areas would be 0% opaque, and all of the white areas would be 100% opaque. If it were plugged into the reflection slot then it would be a reflection map, and all of the black areas would be 0% reflective and all of the white areas would be....you get the idea. In this example for frosted glass, I had to ask "what is it that makes the glass look frosted?" The major difference between frosted glass and regular glass is that you can't see through frosted glass like you can regular. Why can't you see through the frosted glass if it's made out of the same material? That's because light scatters differently. In the A&D material, refraction is what controls the transparency, and glossiness is what controls how refraction is scattered. So that's where I plugged my map into. Sometimes you can plug the map in straight. But in this case to get the most control of your colors, I used a Mix map, then plugged my image into the mix amount. This way I can make sure that the only intensity values used for glossiness will be white and black. 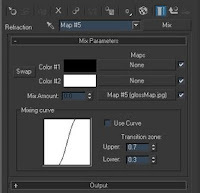 If you created your image map, and screwed up by reversing the black and whites, this is also a good way to switch the blacks with the whites. So now my whites have a glossiness of 1.0 (pure refraction), and black has a glossiness of 0.0 (no refraction), and it gives me that frosted glass look! Great work. Love your blog. So refreshing to find someone who explains why they do something rather than just "put this map in this slot". Understanding how it relates to the physical process and the way the shader works means that we learn something beyond how to create frosted glass. Thanks. Would this be the same tactic to use when trying to get black text to show up on glass? absolutely. 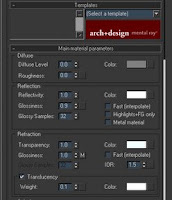 Depending on the effect, you can place this in the diffuse color slot, or the refraction color slot. 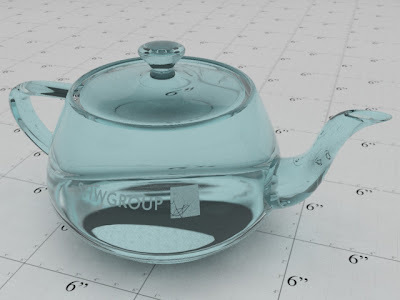 Im using this method for my rendering (3Ds max 8 with vray). Do you have any idea why does my white turns out black? My Black turns out correctly (transparent). Hi, when I use material by your tutorial on my model, I have frozen image everywhere on model ... not just on one place like you, but everywhere. Do you have some idea what i have to do with it? Make sure your map is plugged into the glossiness of the Refraction. Also, you may have to invert your image map.